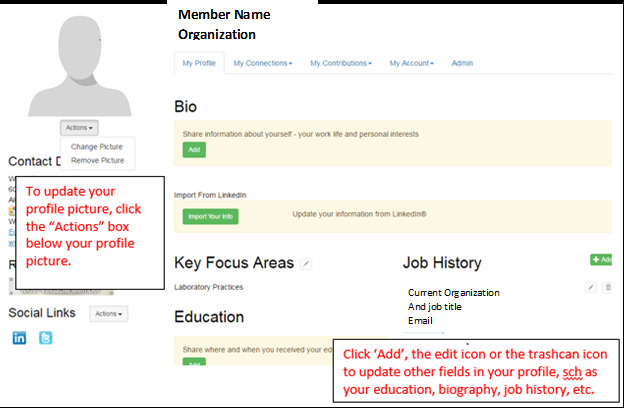 Your WEFCOM profile allows you to showcase your experience as you would in LinkedIn or similar networking site. Your profile picture will be visible and the ‘My Profile’ tab will be selected giving you the option of adding or updating your: ‘Bio’, ‘Key Focus Areas’, ‘Education’, ‘Professional Associations’, ‘Certifications & Credentials’, ‘Honors & Awards’, and ‘Job History’ and/or importing information from LinkedIn. If you already have a profile on LinkedIn, you can save yourself time and effort by bringing your data from LinkedIn to WEFCOM. Simply click ‘Import Your Info'. Choose, step-by-step, which content you want to import from LinkedIn by checking the boxes next to the fields you want to import, and clicking “save and continue” at the bottom. 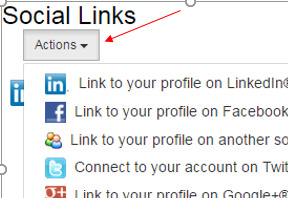 You can also include a link to your LinkedIn profile and other social media, opening the 'Social Links' drop down menu, choosing your media site and entering the link to your profile on that media.